Learn how teachers are using Pinterest in the classroom - from designing lessons to meet Common Core to creating engaging bulletin boards, and everything in between! RI.8.7. Evaluate the advantages and disadvantages of using different mediums (e.g., print or digital text, video, multimedia) to present a particular topic or idea. SL.11-12.2. Integrate multiple sources of information presented in diverse formats and media (e.g., visually, quantitatively, orally) in order to make informed decisions and solve problems, evaluating the credibility and accuracy of each source and noting any discrepancies among the data. SL.11-12.5. Make strategic use of digital media (e.g., textual, graphical, audio, visual, and interactive elements) in presentations to enhance understanding of findings, reasoning, and evidence and to add interest. An opportunity to teach about copyright and Creative Commons since Pinterest doe not ask users to consider permissions before each "pin". Teach your students how to properly cite their sources. The owner of the source has the right to have the pins taken down. Fisher, Michael. "Leverage the Web for the Common Core - LiveBinder." Leverage the Web for the Common Core - LiveBinder. N.p., 13 Nov. 2012. Web. 23 Oct. 2013. What will you use Pinterest for? Landing page is called your "Home Feed" - collection of pins from pinners and board you follow as well as recommendations from Pinterest. To get here, click on the Pinterest logo when you're logged in. Edit your information - add a photo, write a description, update your user name, etc. Cobb, Jeff. "Who Are Your Curators?" Mission to Learn Lifelong Learning Blog RSS. N.p., 2 Mar. 2010. Web. 23 Oct. 2013. This 5:32 minute video gives a great overview of how to use these tools on Pinterest. How will you use Pinterest in the classroom? List your thoughts here. 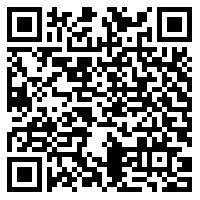 Scan the QR Code to go to the session evaluation site or click here. Please share your candid comments on this eval form as I'd love to hear what you liked and how I can improve this presentation. "16 Ways Educators Use Pinterest." OnlineUniversitiescom. N.p., 09 Apr. 2012. Web. 22 Oct. 2013. <http://www.onlineuniversities.com/ways-educators-use-pinterest>. Andreoentoro. "What Is Pinterest? An Animated Video." YouTube. YouTube, 09 May 2012. Web. 22 Oct. 2013. <http://www.youtube.com/watch?v=oJzD4vF5dFA>. Cobb, Jeff. "Who Are Your Curators?" Mission to Learn Lifelong Learning Blog RSS. N.p., 2 Mar. 2010. Web. 23 Oct. 2013. <http://www.missiontolearn.com/2010/03/content-curator/>. Fernandes, Kim. "Pinterest, Tumblr, Twitter...Oh My!" YouTube. YouTube, 05 Apr. 2012. Web. 22 Oct. 2013. <http://www.youtube.com/watch?v=0_irI4ygBII>. Ferriter, William M. "Blogging." Digitally Speaking / Blogging. N.p., 19 Oct. 2009. Web. 23 Oct. 2013. <http://digitallyspeaking.pbworks.com/w/page/17791566/Blogging>. Fisher, Michael. "Leverage the Web for the Common Core - LiveBinder." Leverage the Web for the Common Core - LiveBinder. N.p., 13 Nov. 2012. Web. 23 Oct. 2013. <http://www.livebinders.com/play/play?id=354939>. Fisher, Mike. 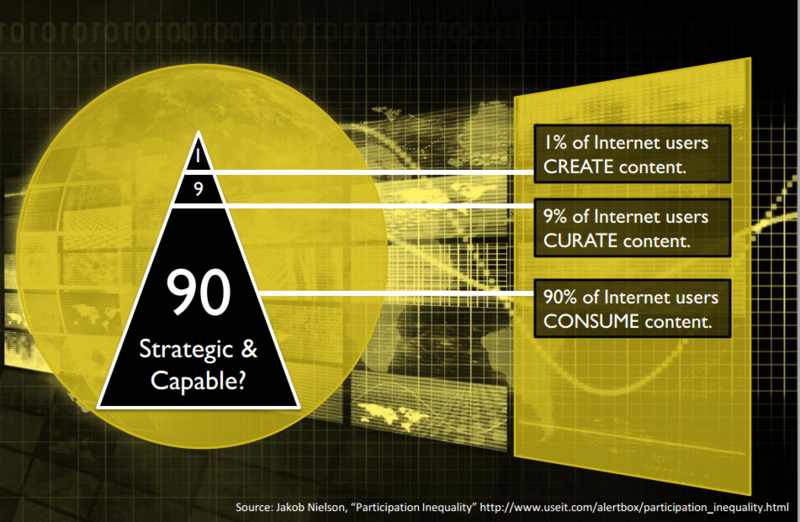 "Digigogy: Collection or Curation?" Digigogy: Collection or Curation? Digigogy.com, 11 June 2010. Web. 23 Oct. 2013. <http://digigogy.blogspot.com/2012/06/collection-or-curation.html>. Glen, A. Adam. 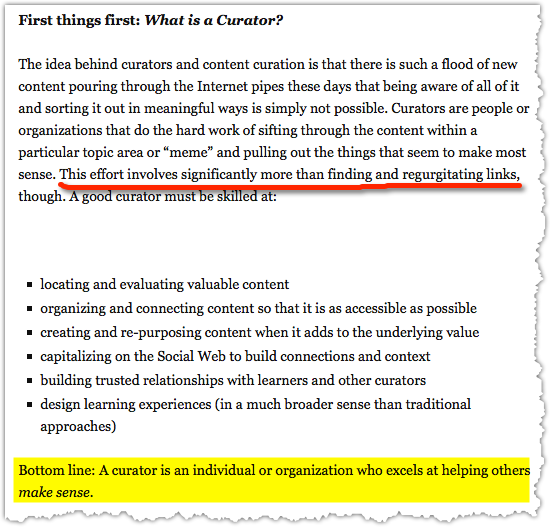 "How Educators Use Pinterest for Curation." Web log post. MindShift. Mindshift, 21 Mar. 2012. Web. 17 Oct. 2013. Gopin, Lisa. "Edudemic Uses Pinterest.mp4." YouTube. YouTube, 28 Feb. 2012. Web. 22 Oct. 2013. <http://www.youtube.com/watch?v=ULfVP1m_-tg>. Livebinders. "Curation and Common Core with Mike Fisher." YouTube. YouTube, 30 Mar. 2012. Web. 23 Oct. 2013. <http://www.youtube.com/watch?v=hldbE6-a_gM>. Sheninger, Eric. "Pinterest for Educators?" Edutopia. Edutopia, 19 Mar. 2012. Web. 22 Oct. 2013. <http://www.edutopia.org/blog/pinterest-for-educators>. TeachThought Staff. "14 Brilliant Bloom’s Taxonomy Posters For Teachers." TeachThought. N.p., 7 Apr. 2013. Web. 23 Oct. 2013. <http://www.teachthought.com/learning/14-brilliant-blooms-taxonomy-posters-for-teachers/>. "T4LT - Pinterest." YouTube. YouTube, 02 July 2012. Web. 22 Oct. 2013. <http://www.youtube.com/watch?v=PB8KzCOq6QA>. West, Angela. "BizFeed." PCWorld. N.p., 26 Feb. 2012. Web. 22 Oct. 2013. <http://www.pcworld.com/article/250700/what_you_should_know_about_pinterest_and_copyright.html>.